Mark Petruniak, a member of the Jersey Shore Boca U20 team and freshman midfielder at American University, was named to the Patriot League Academic Honor role league officials announced last week. He was a member of the Boca U20 team last summer that advanced to the semi-finals of the USASA U20 Regional Championship as well as the semi-finals of the MSSL Cup. 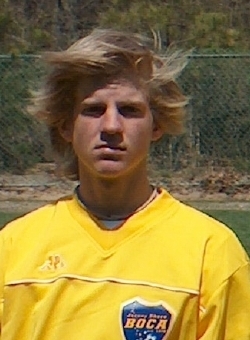 WASHINGTON, DC (February 5, 2006) – Mark Petruniak, a member of the Jersey Shore Boca U20 team and freshman midfielder at American University was named to the Patriot League Academic Honor role league officials announced last week. Petruniak, who graduated from Hightstown High School in 2005, played in 12 games for the Eagles this past season, helping them advance to the Patriot League Tournament finals before loosing 1-0 to Lafayette. He has not yet declared a major at American. The smooth, outside attacking midfielder was a member of the Boca U20 team last summer that advanced to the semi-finals of the USASA U20 Regional Championship as well as the semi-finals of the MSSL Cup Championship. Including Petruniak, Jersey Shore Boca had a record fifty-five club standouts who previously played for Boca on either their Men’s, Super Y-League, PDL, Club or Youth teams that participated in NCAA intercollegiate soccer last fall for their respective institutions. This was the highest number of Jersey Shore Boca players to ever participate in NCAA intercollegiate soccer during the same season in Club history.